"....distributive justice without participative justice can only ever be coincidental." Much has been written recently on the question of where the Occupy Wall Street movement came from. The assumption seems to be that it represents a new manifestation of the counter-globalization ethos that first showed up in Seattle, 1999. In some ways this is true, but the actual tactic, camping out, looks to me like an evolution from the tree-sitting strategy of radical environmentalists. Forget about Facebook and Twitter: this is the REI generation, and they want to climb and bivouac their way to liberation. It really makes sense when you think about it. To transgress the landscape of capitalist property rights, you need the proper gear. The only anomaly I can see is that pepper spray is being used against the campers, not by them. Footnote: It might be argued that the starting point was really Greenpeace, which drew on small craft culture for its maritime adventures. Having noodled around in both outdoor and boat equipment shops, I think I can say that they represent two rather different slices of humanity, and the probability of crossover was slim. Of course, Greenpeace was also practicing urban mountaineering around the same time as Earth First was exploring the canopy zone. Maybe you’re in a hurry, so here is the problem in its general form: most of the reading public, even most of the fairly well-educated reading public, have little exposure to mainstream economic reasoning. If they ever took an econ course, they did not come away with a durable understanding of opportunity costs, markets as cost-benefit algorithms and coordinating devices, market failure, etc. This means there’s always an audience for a book that packages these rather standard ideas in a clever, unexpected or cool way. Unfortunately, underneath the ribbons and shiny paper, it’s the same old same old. Some persons, partial to the patriots of this age, have ventured to put them in a balance with the most illustrious characters of antiquity; and mentioned the names of Pym, Hambden, Vane, as a just parallel to those of Cato, Brutus, Cassius. Profound capacity, indeed, undaunted courage, extensive enterprize; in these particulars, perhaps the Roman do not much surpass the English worthies: But what a difference, when the discourse, conduct, conversation, and private as well as public behaviour, of both are inspected! Compare only one circumstance, and consider its consequences. The leisure of those noble ancients was totally employed in the study of Grecian eloquence and philosophy; in the cultivation of polite letters and civilized society: The whole discourse and language of the moderns were polluted with mysterious jargon, and full of the lowest and most vulgar hypocrisy. • and above all, the potential for positive feedback mechanisms (release of methane from peat bogs, permafrost and clathrates) that could trigger runaway, catastrophic increases in atmospheric carbon concentrations. Personal preferences for a few degrees of temperature more or less have nothing to do with it. Tol seems to be another poster child for the tendency of economic expertise to coexist with appalling ignorance about just about everything else. Is economics worse this way than other fields, or am I just more sensitive to it because it rubs off on my reputation as well? This extraordinary singer died a few days ago at the age of 69. She had it all: purity of tone, deep personal expression, the ability sing in a vast array of styles, from Arabic and Sephardic to medieval to opera to folk song. If you haven’t heard El Cant de la Sibilla, her recreation of a medieval religious incantation, or Ninna Nanna, her complication of lullabies from around the world and across the ages, you are missing something wonderful. As faction is the effect of that loose government which is unavoidable in a time of war and trouble; so, while faction is suffered to continue, it is a perpetual bar to better administration; for it emboldens the bad, and terrifies the good. Is a lunatic, whom the physician cannot approach without danger to himself. Some statesmen, therefore, when it rages high, withdraw from affairs, and will not administer the physic of their councils till the fit is over. Is The Italian Crisis A Possible Self-Fulfilling Prophetic Negative Bubble? Many observers are declaring Italy to be the key to whether the euro will collapse and along with it possibly most of the world economy. Having removed the near term problem from office, Silvio Berlusconi, the markets are not satisfied with the appointment of respected economist technocrat, Mario Monti, to replace him, with bond yields continuing to rise, thus threatening to bring about a crisis. 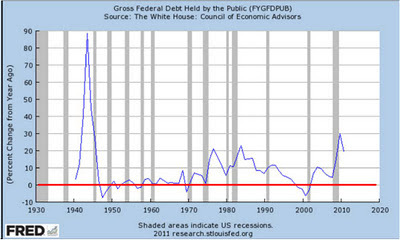 What is it that Monti is or even can do to stop this? Quite likely not a damned thing. Looking at supposed fundamentals, there should not be a problem with Italy. It is one of only four Eurozone nations that is currently running a primary budget surplus. The others are Luxembourg, Belgium, and Germany. Where is the problem? 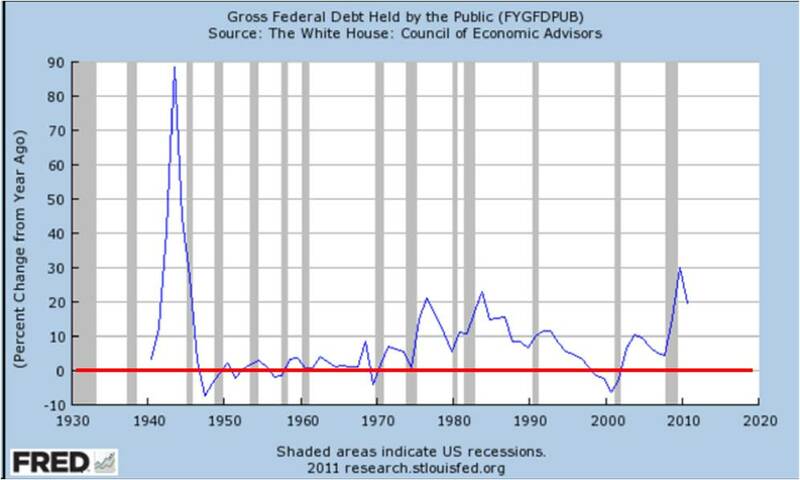 Well, some say, aha!, look at the national debt to GDP ratio, a too high 120%. However, not only has Italy had a ratio such as this for a long time, and even been higher prevously, such as in the early 1990s, it has a much higher share of its debt domestically held, Italy has a much higher savings rate than most European nations (on the order of 17%). This would explain the NY Times story today that as long as Italians continue to hold their own debt, the euro will be saved. What about proposals being made in Italy? One is that the retirement age be raised from 65 to 67. Maybe this should be done, but again, Italy has a primary budget surplus, and 65 is higher than quite a few other European nations have as a retirement age. And if such a "reform" is passed, it will have little near term impact on the budget balance, although maybe doing so will induce that magic effect of "raising confidence," thus bringing down the interest rates. The other is labor market reforms, particularly to open up various professions to more entry and competition. This will be hard to pass, but I think there may be reasons for doing this, and this may well help increase the growth rate, which has been low for a solid decade, and needs some stimulus, however achieved. But, again, this is not likely to affect the budget balance at all. Why this would bring down overly high interest rates is also very unclear aside from hoping for the "confidence fairy" to suddenly appear. That the confidence fairy has not appeared with the removal of Berlusconi is disturbing. It looks increasinigly to me that these high interest rates are simply a self-fulfilling negative bubble on Italian bonds unjustified by any actual fundamental phenomena. Even with the high interest rates, most reports suggest that Italy can manage to avoid any defaults for at least another year. It is not Greece, or even the less troubled Portugal, Ireland, or Spain. It is basically solvent. The only real threat is the high interest rates, apparently existing because of the fear of what high interest rates can do, a possible self-fulfilling prophecy, an empty, if still dangerous negative bubble. The recent elections in Spain point once again to a flaw in the voting procedures of all supposedly democratic countries: they prevent citizens from expressing what they actually think in the voting booth. Do you suppose there was a sudden outpouring of love for the Spanish right? More likely, there was an outpouring of disgust for the Socialists and the economy-without-a-future over which they preside. The ballot, however, did not offer the opportunity to vote against the party in power, only for the opposition. Thus the conservative Popular Party will enter government with what it claims is the support of the majority, when the reality is that is probably has less support than it had at the time of the previous election—which it lost. There is a simple solution: provide voters with the option of either voting for a candidate or party, if they want to express support, or against a different one if they want to express rejection. The final tally would be the number of votes for minus those against. In a two party/candidate race the final result would be the same. In a multi-party race, voters would have to think strategically about whether their feelings are more concentrated for or against any particular alternative. In either case, you would see clearly the extent to which democracy was working, in the sense of producing a government that citizens actually support. My guess is that, given a negative option, the people of Spain would have delivered two verdicts, one against their current rulers and the other, only somewhat less intense, against their future ones. They should have had that chance. If the euro disintegrates because of a failure to take short-term measures needed to support it, we won’t have to worry about long run governance issues. Just in case the e-zone gets through the immediate crisis, however, here are a few thoughts based on US experience. I just glanced at Tyler Cowen’s model of a Eurozone downturn and noticed there are a couple of minor elements missing—the trade imbalances between the surplus and deficit countries in the period leading up to the financial crisis, and the financial crisis itself. That’s right: Cowen explains the current Euromess without any reference to what transpired in 2008. Imagine how much worse it would be if the crisis that actually happened actually happened. I don’t know what your reaction was, but the first thing that popped into my mind was, why take it out on the janitors? If the school was failing it wasn’t their fault. According to Gingrich, it’s the teachers who can’t make the grade. So why not put the kids to work following lesson plans, going over last year’s standardized tests, etc.? There would be as much pride in this as in cleaning toilets. But let’s not get hung up on details. Isn’t it nice having a historian running for president—someone who knows what was really good about the good old days? Speaking of Germany and economic virtue, here is a question about the Walt Disney classic, Three Little Pigs. Take a look at the third little piggy, the one who builds his house of bricks. He wears overalls. In American pop culture circa 1933 (the date of the cartoon’s release), only farmers and Germans wore overalls, and I don’t see a farm. Also, the first two piggies play the flute and fiddle, while No. 3 has a piano with sheet music. As a footnote to the previous post, here is an observation about the German obsession with inflation. Media accounts always bring up the hyperinflation of the 1920s and its supposed role in ushering in the Third Reich. This is bad history: a decade transpired between the inflationary madness of 1923 and the handing off of the chancellorship to Hitler. That trope should be buried once and for all. European institutions, including the Eurozone, remain treaty organizations whose members are sovereign countries. This is why important policy decisions have to be unanimous. As a result, we have heard the lament that small, wayward countries have an unwarranted veto power and can hold everyone else hostage. You know, the Finns, the Slovaks and their ilk. In fact, the small and weak do not have this power. If they try to throw sand in the gears, they will be put in their place one way or another. A country like Finland, for instance, is simply too vulnerable to political and financial pressure to try to dictate Eurozone policy single-handedly. Was anyone surprised when the True Finns, a party that campaigned on xenophobic nationalism, backed down and allowed the latest Greek financing package to go through? The real threat to multilateral institutions has always been the veto power of the strong. This is true of the US within the UN system, and it is increasingly clear that it is true of Germany in the current euro fiscal crisis. As the moment of reckoning draws near, and as the need for a true lender of last resort to backstop euro-denominated credit becomes inescapable, one after another, the members of the zone are falling into line and demanding that the ECB mature into a real central bank. Everyone except Germany. Angela Merkel draws her line in the sand: “If politicians believe the ECB can solve the problem of the euro’s weakness, then they’re trying to convince themselves of something that won’t happen.” Hans-Werner Sinn, an economist whose every pronouncement is accorded scriptural authority, spits out the epithet “printing press” six times in a recent op-ed demanding that the ECB remain neutered. Two of the campuses of California State University are striking today. The timing of the strike is unfortunate, coming at the same time as fees are raised once again almost 10%. The union realizes that pay raises are a small part of the overall abuse of higher education in California, but strikes are only permitted in opposition to the contract with University system. Chronic underfunding began during the first term of Jerry Brown, when the passage of proposition 13, frightened him. Not only is the administration grossly overpaid, its management style is arrogant and heavy-handed. Finally, the gutting of public education at all levels means that students come to the University underprepared and, more often than not, lacking the funds to pay for their education. Not only do they fall under a heavy debt burden, they work too many hours after school in order to focus on their education. To add insult to injury, all of us have to listen to public figures telling us how our economic future depends upon educating young people, presumably without any tax burden unless such funds are directed to hedge funds engaging in charter school scams. On stage, the core of Väsen is Olov Johansson, who plays the nyckelharpa–like its name says (in Swedish), a stringed instrument with keys. He flies through complex runs in the dance tunes and produces a resonant tone for the slow airs. While a few of the pieces they played were traditional, most were composed by one of them, especially the fiddle player, Mikael Marin. Väsen’s virtuosity is exceptional. Their sound is rich with harmony (think Ravel), even when they are blasting away at high-tempo polkas. Toward the end of the night they started to fool around, and this was good too. Lucy in the Sky with Diamonds mixed in with 18th century Swedish fiddle standards—why not? They will be returning to the US in a few months, playing the Wintergrass festival in Bellevue in February and other events. Not to miss. I am writing a first draft of my introduction to the paperback edition of my book. Any feedback would be very much appreciated. The Confiscation of American Prosperity: From Right-Wing Extremism and Economic Ideology to the Next Great Depression first appeared in October 2007, just as the stock market was peaking. Judging by the public pronouncements by economists and the business press, the economy appeared modestly healthy before the breakdown of the subprime mortgage market. In fact, the weakness of subprime mortgage market was a symptom of deeper problems that had been eating away at the economic core. In addition to a diagnosis of these deeper problems, such as growing inequality and an emphasis on financial activities, rather than more productive economic endeavors, the book offered a historical analysis of the willful gutting of the economy that occurred over the last four decades. The Confiscation of American Prosperity presents this history in the form of a crime story, beginning with an accounting of the economic plunder engineered by a small part of society, with the complicity of both political actors and many, if not most, economists. The second part of the book describes the way that this group was able to carry out the theft of enormous wealth. In the tradition of crime stories, the third part of the book examines the expected retribution. The final section addresses the incompetence of the economists, who should have acted as policeman while the plot was unfolding. The recent protests of the Occupy Movements indicate a deeper understanding of the crime than either the business press or the economic analysis following the meltdown of the financial system. The protesters correctly realize that many of the most serious perpetrators have escaped from the crisis without retribution. Their outrage might contribute to some modest retribution, but the expected retribution discussed in the book will come from more serious economic disruptions that are all but certain, without addressing some of the economic imbalances created by the crime. Of course, the economy can begin showing signs of health once again, but sooner or later the imbalances will take a serious toll on the economy. Historically, economic crises do tend redress some imbalances, but political mobilization is also an important element in returning to a more healthy balance. One can only hope that such mobilization will be effective enough to prevent another Great Depression. In the past couple of weeks, the Sandwichman has uncovered not one but TWO previously unheralded milestones in the history of "best-known fallacy in economics". The first is a erudite defense by an accomplished first-generation political economist, Rev. Thomas Chalmers (1820), of the proposition that "there is a certain quantity of work to be done; and this quantity, generally speaking, does not admit of being much extended, merely on the temptation of labour being offered at a cheaper rate..." The second is a spirited plea by Dorning Rasbotham, Esq. (1780) for the use and encouragement of machines that attributes to "some persons staggered by this argument" the false view that there is only "a certain quantity of labour to be performed." Ecological Headstand has commenced a series on "The Moral Philosophers' Stone: A Compleat History of 'A Certain Quantity of Labour to be Performed.'" The antiquity of Rasbotham's fallacy claim and the cogency of the Chalmers proposition suggest the persistence of the former as a pre-analytical, essentially pre-industrial fossil, petrified by ad hoc explanations. An investigation into origins would lead to the identities of early leaders, at least, and the search for the broader leadership of the movement should continue from there. I polled a group of journalism educators on the question of how The Times should direct its coverage henceforth. Not all agreed on this, but most said it was important to understand who the leaders were and what demographics they represented. This brings me back in time, to the late 60s and early 70s, when another largely formless movement was making itself felt in America. On the ground, this radical upsurge was composed of affinity groups, underground newspapers, community storefront projects and streetcorner networks. It had a visceral distrust of leaders and authority, of having others speak for you. Nevertheless, a pathological symbiosis developed between the media and a relatively small number of movement self-aggrandizers. The ambitious would-be leaders discovered that they would be anointed by the media as long as they adopted ever more outrageous postures and rhetoric, and the media found that by focusing on them they had a story they could cover in a convenient, template-satisfying way. Unfortunately, that was not all. Because the movements of the time had weak institutional structures, they ultimately depended on media coverage to attract new recruits and hang onto old ones. Thus, when “leaders” like the Weathermen and the Black Panther Party flamed out, they sucked the rest of us down with them. But here’s the thing: neither I nor anyone I knew in this movement chose these “leaders”, nor did we feel represented by them in the slightest. Our story, whatever it was, had little to do with its representation in the media. We were seeking something completely different, but this quest was cut off and even our memory of it was gradually erased by years of repetitive, fixated discussion of our Promethean but, alas, flawed “leadership”. Lessons? They are partly about the role of the media in refashioning social movements so they fit the standard journalistic model of who they are and how they should function. Even more, they are a warning to the movements themselves, that they have to give thought to their own self-defined structures that convey who they are, what they believe, who is permitted to represent them, and how new recruits can join in. Klein got her start, at least outside her native Canada, as a cultural critic in the wonderful book No Logo. Since then, with each project she has dipped further into economics, with a weird bifurcation: her political and cultural analysis has become even more insightful, but her understanding of economics has not kept pace. This was a problem in The Shock Doctrine, and it is a problem in her missive on climate change on view in the current Nation. It seems incredible that any economist, as late as this year, would claim that for the very first time in history there has been performed an investigation into the network of owners of global capital. But that is indeed what authors Vitali, Glattfelder and Battiston state in the opening paragraph of their abstract entitled 'The network of global corporate control'. "...nearly 4/10 of the control over the economic value of TNCs in the world is held, via a complicated web of ownership relations, by a group of 147 TNCs in the core, which has almost full control over itself. The top holders within the core can thus be thought of as an economic “super-entity” in the global network of corporations. A relevant additional fact at this point is that 3/4 of the core are financial intermediaries...."
The implications are mind boggling. How incredibly fragile must the global economy be when such an incredible lack of diversity of enterprise (and therefore also of intellect and strategic resilience) are present. It is possible to see our world now facing very serious global trading and current account imbalances due to these enormous organisations having moved their gigantic 'enterprises' into pockets of cheap labour, land and currencies to gain an artificial economic advantage. As one big TNC after another diversifies into many enterprises there is a simultaneous loss of diversity for the economic system as a whole. This problem escalates when TNCs combine strategies through global networks. It's not surprising that vast portions of world trade have long metamorphosed into non-trade intracorporate transactions. I sometimes carp about minor missteps, but this is big. In a front page “explanation” of how the eurozone got into a sovereign debt crisis, there is criticism of myopic banks, lax regulators and spendthrift peripheral governments, but no mention of the fundamental underlying cause, the swelling imbalances between surplus and deficit countries in the currency union. where BP is the net savings of the private sector (income minus spending for households and firms), BG is the government's fiscal surplus or deficit, and CA is the current account balance (mostly trade). Over the decade of the 00's, the peripheral countries were running ever larger trade deficits with the core countries, especially Germany. At first these deficits were financed by private sector borrowing, but after the financial crisis hit private sector leverage froze, economies contracted, and governments stepped in to do the borrowing themselves. Before 2008 the problem was too much borrowing in real estate, banking and other sectors; after it was too much borrowing by the government. Yet, as long as the trade imbalances grew, one or the other was unavoidable. So the real story, the one that the Times should have told, is about how the imbalances grew, why few noticed, and how the eurozone framework, with its utterly irrelevant “Stability and Growth” criteria, was unable to cope. Skip the Times and get your news and views from the econ blogosphere. Footnote: Nothing Greece and Italy do by way of budget policies or “reforms” can solve their sovereign debt problems. They might as well sacrifice goats to the gods. The only practical significance of the current political drama is that it will or won’t persuade the core countries to open the liquidity spigots, write down debts and resolve the banks.